Thirty-five years ago, in June 1970, Pete Petit's infant son, Brett, died in his sleep. In an instant, Pete Petit's life was turned upside down, and he and his wife joined the ranks of thousands of parents who lose their children each year to crib death and Sudden Infant Death Syndrome, or SIDS. Petit was 30 years old, an engineer working as a project manager at Lockheed in Marietta, GA, with bachelor's and master's degrees in mechanical engineering from the Georgia Institute of Technology. He was grief-stricken, and in his anguish, he did what he was trained to do -- he asked questions to try to understand what happened. How common is SIDS? Was it preventable? And could he help others avoid what his family was going through? Since then, Pete Petit has built a series of successful healthcare companies. 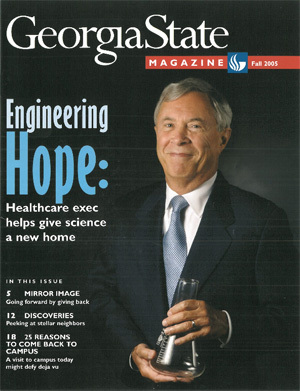 He gave $5 million to endow the Parker H. Petit Institute for Bioengineering and Bioscience at Georgia Tech and in 2002 pledged $3.3 million to help construct the building that houses the institute. The Petit building is an interdisciplianary, state-of-the-art laboratory providing teaching and research facilities for students majoring in science programs to be housed there.